My name is Sophie and I am very tired. My name is Sophie, it is 22:38 and I don’t really want to write this blog post. My name is Sophie and I want to curl up in bed and fall asleep but that’s not going to happen because it takes me three years and a sacrifice to the gods to get to sleep. So I’m going to talk about sleeping and bedrooms that look extra cosy. Hence the header pictures – it combines everything I want in a bed. I like loads of pillows and I don’t know if it’s trying to replicate a partner (in the completely innocent sense of the word) but I love having a lot of pillows, a duvet that looks like it’s been slept in and not all neatly folded, more pillows or cuddly toys to make it cosier and fairy lights to make it cute and tumblr. I love the idea of having a big window seat the I can curl up in and watch the sun set like in the header picture – as a writer, I can picture myself sat there with my laptop on my lap (an Apple Mac isn’t compulsory but it would make me very happy) just watching the sun set or the stars or whatever was outside my window. I’ve always wanted a window seat. In my bedroom I have walls full of pictures and I absolutely adore it, when I have my fairy lights on, you can see it really clearly and it just makes me think I’m halfway towards my ideal bedroom. If I had a double bed that is. At 5’10” I am basically too big for a single bed but my room is quite small so there’s no way you could ever fit a double in my room without it becoming an obstacle course to get in it. I love the idea of having a really cosy bedroom, bathed in a sort of artificial yellow light with different patterns and soft colours and really fluffy duvets. The thought of being able to buy all these things for my own bedroom and maybe even a flat or a house in the not-too-distant future excites me a lot. For a very lazy person, I really like the idea of interior decorating. But I have not the funds nor the inclination, so that’s a dream for a bit further along in the future! What would you put in your ideal bedroom? 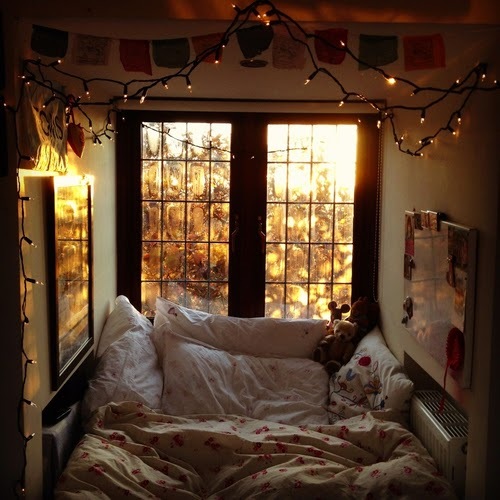 Do you like fairy lights and lot of pillows or would you rather something completely different? Let me know in the comments!